I’m often asked how to choose a stock to trade? What do I look at that ultimately sways my decision to go long or short? So I’m going to give you a run down today at what I look at and how you can start to do the same. This is actually a stock that I’m interested in trading soon. Firstly, I will look at the monthly and weekly charts. This gives me an idea of where the price is going. Looking at the above monthly chart, I can see that there seems to be a nice steady trend in place. There is a similar picture on the weekly chart. Finally, I will load the daily chart as this what I will be using for my final analysis and entry points. When looking at the daily chart, I’ll now start to use my other indicators to make an informed decision on where to enter a trade. I’ll start by checking to see if my moving averages have crossed over? Are the candles forming above the moving averages? Is the trend still in place? You can see that this is the case on our daily chart. I use different moving averages depending on how long I am looking to trade a particular market. Shorter term I’ll use moving averages around 20 days [the longest period] Medium term 50 days and longer term 200 day moving averages. Now as the trend has already been identified, we are looking for a good entry point. This can be a tricky decision as you can quite easily over think the situation and delay the entry, or you’ll find that you do enter but wish you hadn’t because the price shoots of in the opposite direction. The main thing to remember is that you are not trying to enter at the absolute low or high… it’s a nice idea but in reality it rarely happens. As long as you enter and follow your rules, and you are not trying to buck the trend, then you should be ok.
It’s ok to open a trade and the price moves in the opposite direction. Prices move up and down… that’s the name of the game. Just go again when the time looks right. Overall when trend trading you’ll come out on top over time. Good entry points are at the moving average crossover as already mentioned and also at price breakouts when price moves above or below support or resistance levels. Using our Mastercard chart, we can set our entry points where the price goes beyond a previous high. Volume and candle patterns can be incredibly useful entry indicators when you combine them with your charts. I can’t possibly tell you how to trade using either in a single blog post… I just couldn’t do it with any detail that the methods deserve. However, you can get some free info here. This guy is a bit of a legend when it comes to candle chart patterns. I also have a copy of this book… although personally I found it a bit over rated compared to the reviews, it is still probably the best book on the subject. 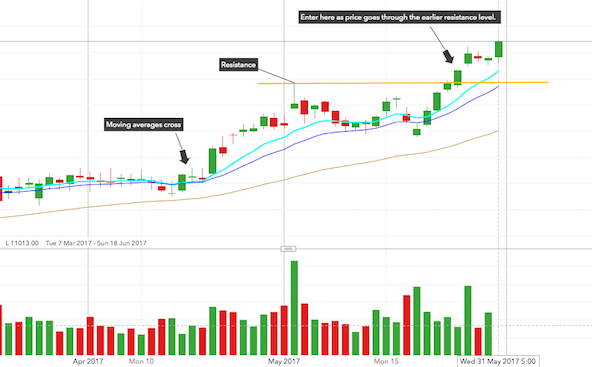 Learning about volume and candle chart patterns, combined with moving averages is many a pro trader’s main arsenal when it comes to entry points. As you know, there are hundreds of other indicators that you can use. MACD is another I use to confirm trends and entry. Stochastic oscillator can be very useful too, as this can identify price direction change [swings]. For me though, I’m mainly moving averages and trend following. It has been the core of all my trading. It keeps thing simple and easy to see. Analysing a company and delving deep into its current news can sometimes give you a clue to where the price may be heading. Profit announcements, mergers, product launches, new land acquisition, new directors and so on… can all play a part in knowing which way a price might move. For me personally, I am of the opinion that what we need to know has already been factored into the current price. That said, Vince Stanzione is an absolute master at identifying emerging trends. I have no idea how he does it, nor do I have any idea how many points he has made me on this information alone??? It is many thousands though. My main tools are moving averages. I have not changed the foundations of my trading since I have started… that’s because long term moving averages have remained profitable. Deciding on a good entry point is all you need to do once you have seen a trending stock. Again, keep that simple too. If spread betting is a little to nervy for you, start by trading binary options and then move on to spread trading from there.